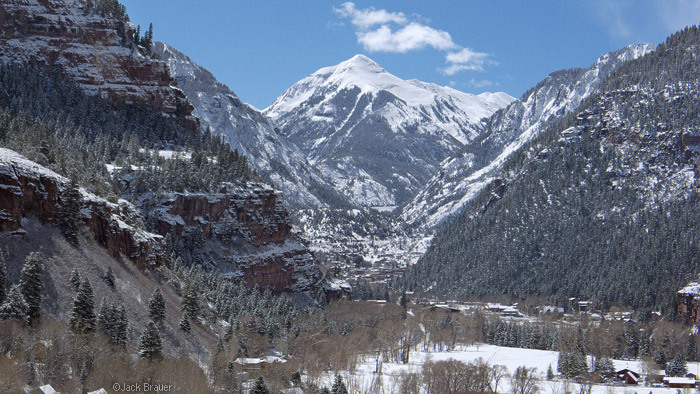 As you drive into the town of Ouray on Main Street, you can often see a gleaming snowcapped peak looming up the valley to the southwest – this is United States Mountain. 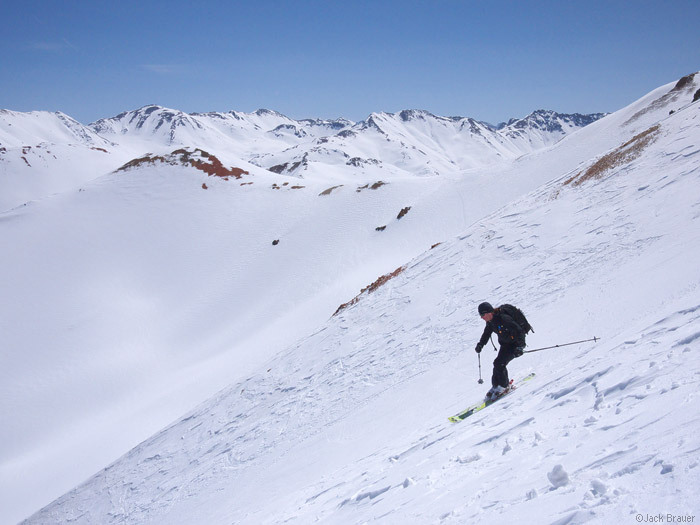 Today we hiked up there and scored a great ski/snowboard descent! 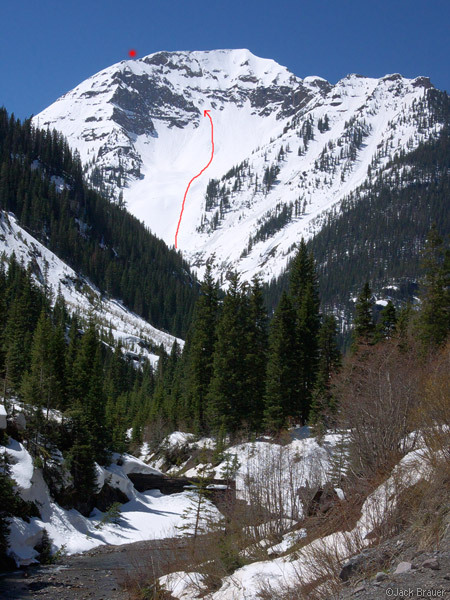 A view of the line we hiked and skied/snowboarded. 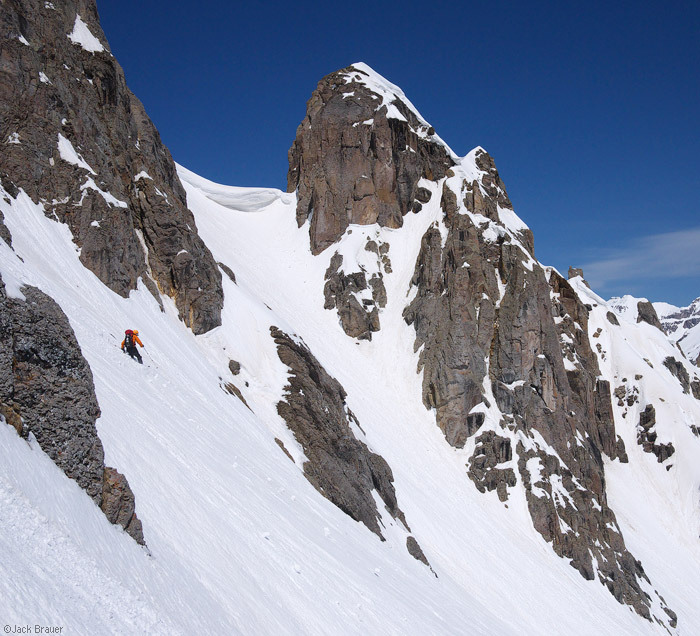 There’s a large couloir hidden amongst the top cliffs, which we ascended and descended. 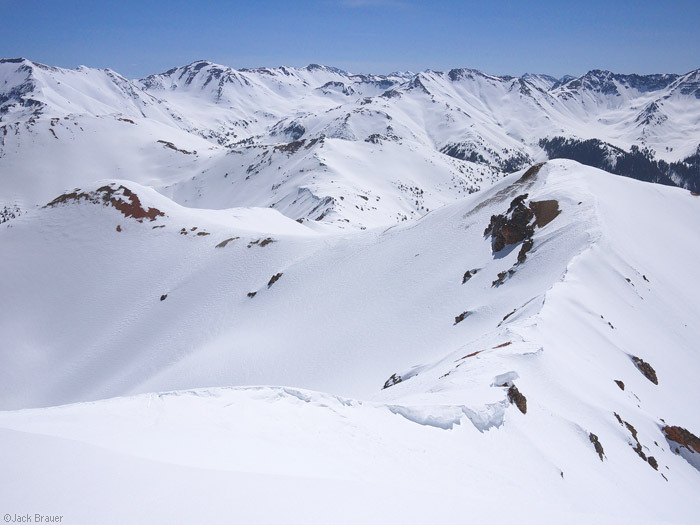 Posted in Colorado, Skiing/Snowboarding and tagged Colorado, San Juans on May 8, 2011 May 19, 2013 by Jack Brauer. This morning I got out on the snow for the first time since getting back to Ouray. I was surprised at how snowy it still is in May! The spring skiing season is looking good! 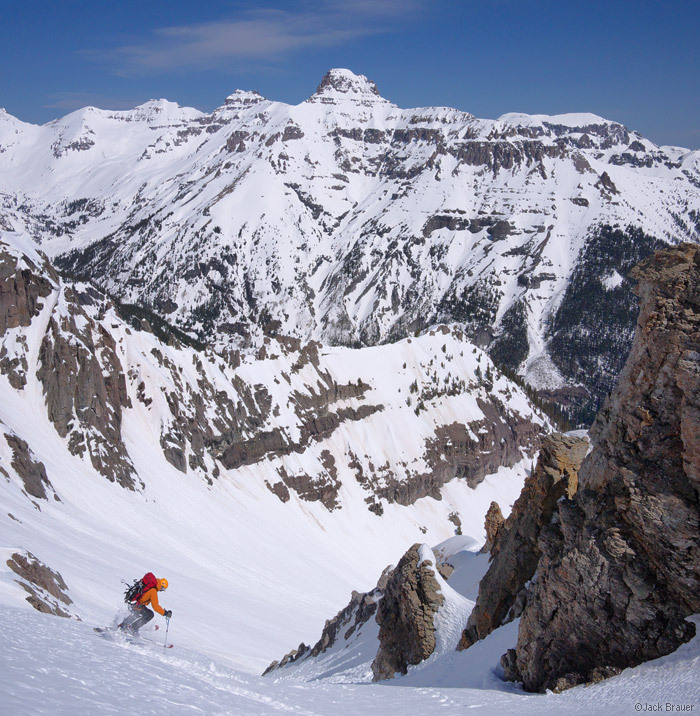 Posted in Colorado, Skiing/Snowboarding and tagged Colorado, San Juans on May 7, 2011 May 19, 2013 by Jack Brauer. After a series of flights and frantic airport connections on Sunday, I finally made it back home to Ouray from Europe! 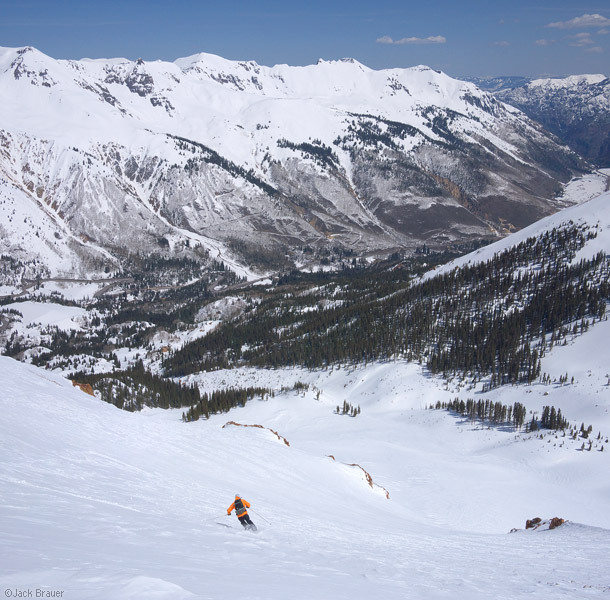 It was quite a shock to come from full-on spring in Germany and Switzerland to full-on dumping snow in Ouray! It seems that spring is in no hurry around here; the trees are still bare and there looks to be quite a bit of snow in the higher peaks. The photo above was taken on Monday morning after about 8 inches of fresh snow blanketed the town overnight. The recent snow melted in a few days and today I went on a hike up one of the drier trails in the Amphitheater above town. It’s always interesting to return to the San Juans after visiting foreign mountains. I see with fresh eyes and appreciate the subtle characteristics that make these mountains unique. 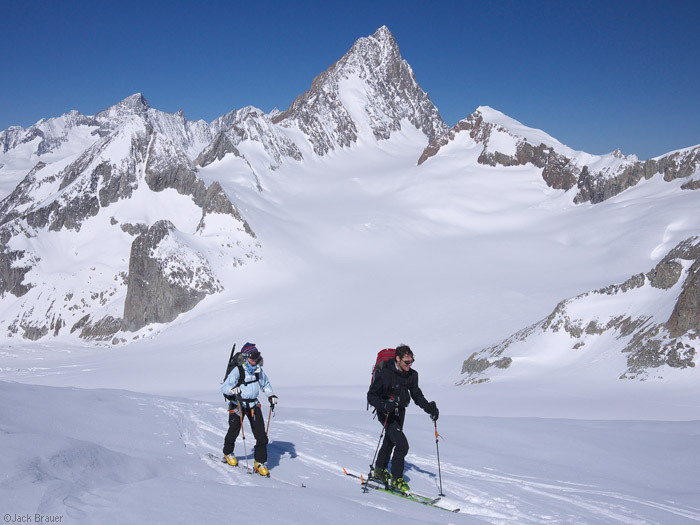 For example, while the mountains around Ouray aren’t quite as large, dramatic, and glaciated as the Swiss Alps around Engelberg, these mountains are more complex, with a much broader network of connected valleys and branching terrain. Anyhow, it feels great to be back, and I look forward to a fun summer – especially when Claudia gets here in July! But first, a couple months of springtime adventures on the snow! 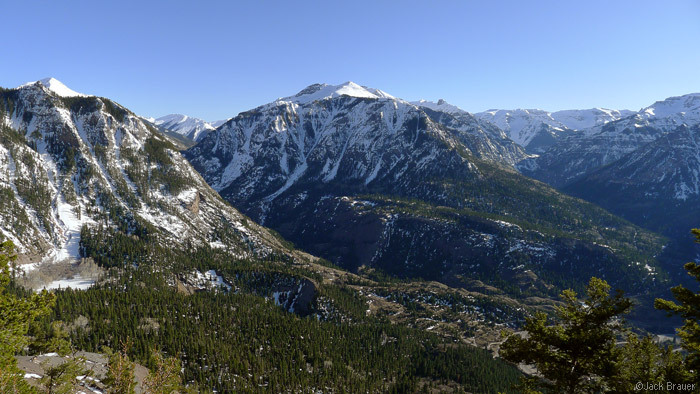 Posted in Colorado and tagged Colorado, Ouray, San Juans on May 4, 2011 May 19, 2013 by Jack Brauer. Posted in Alps & Europe and tagged Germany on April 29, 2011 May 19, 2013 by Jack Brauer. 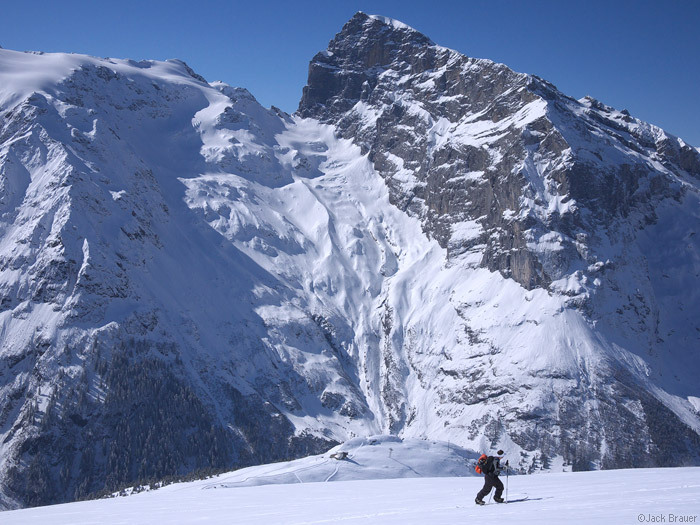 This last week I went on a ski hut tour in the Bernese Oberland mountains of Switzerland. 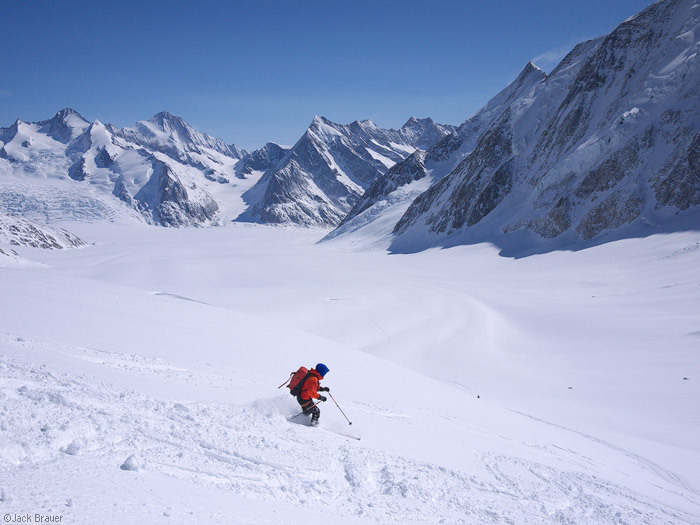 This is the heart of the Swiss Alps, and during the course of 6 days we skied a variety of routes across the largest glacier system in the Alps. Each night we ate and slept in Swiss alpine huts along the way. 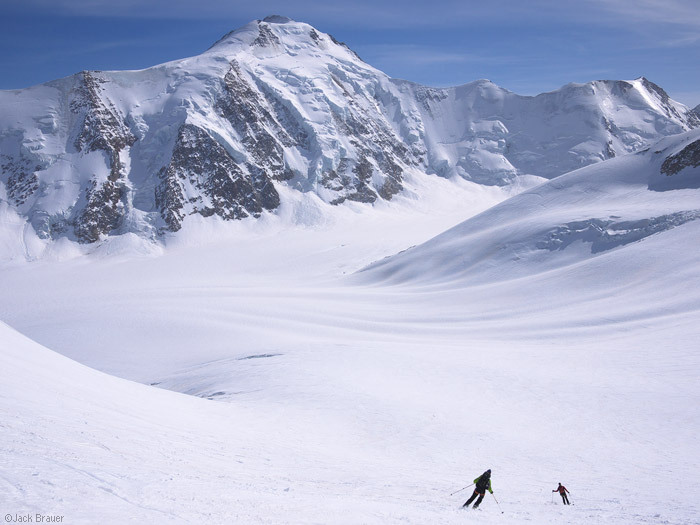 Posted in Alps & Europe, Skiing/Snowboarding and tagged Switzerland on April 18, 2011 November 21, 2013 by Jack Brauer. A funky cloud hovering over the Matterhorn signals the approach of another storm - March. One more shot from my last trip to Zermatt, as seen from Riffelalp. Posted in Alps & Europe and tagged Switzerland, Zermatt on April 2, 2011 May 19, 2013 by Jack Brauer. 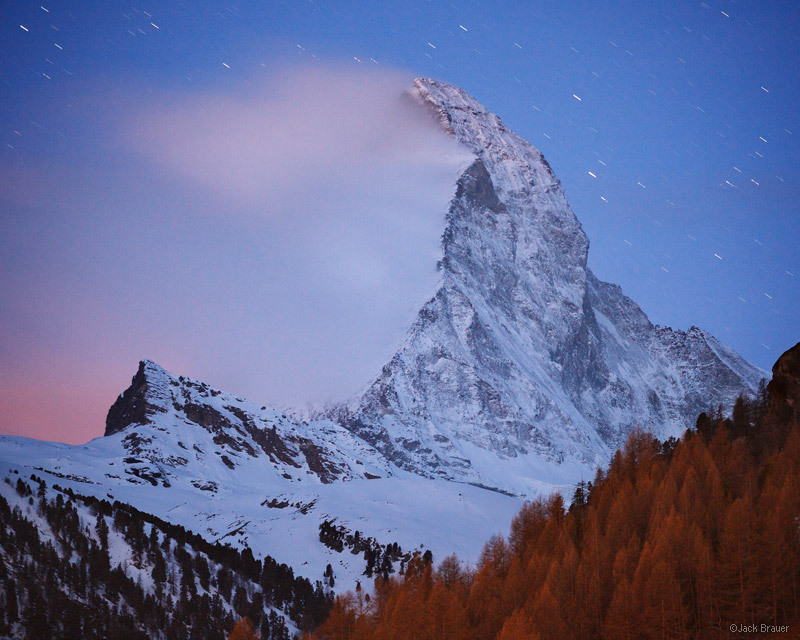 Stars over the Matterhorn, as a rising 10% moon illuminates the sky with pastel hues - as seen from Zermatt. The camera's high sensitivity long exposure "sees" much more than what was visible to the naked eye; when I took this photo, I could barely even see the shape of the Matterhorn. 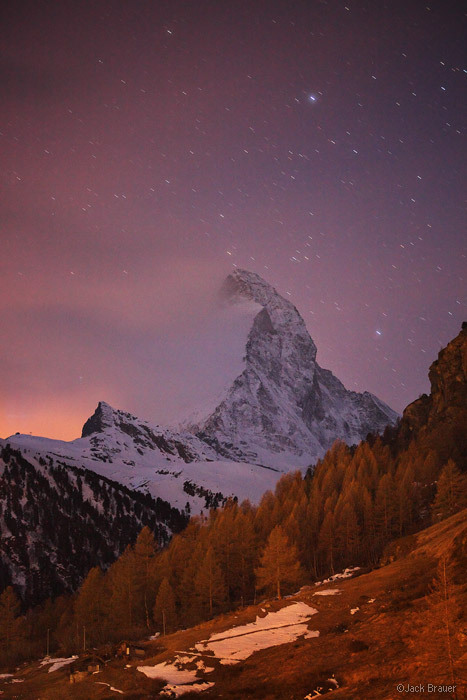 Dim moonlight, stars, and the Matterhorn. 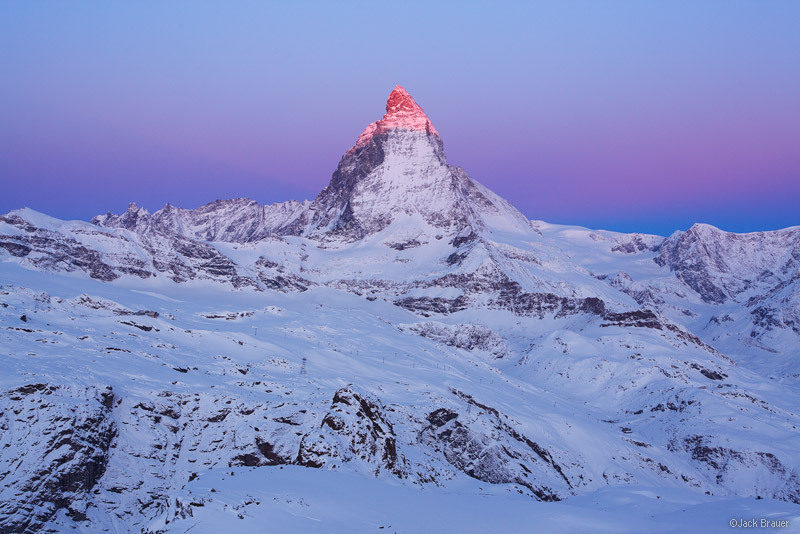 This was taken after "Matterhorn Stars #1", and by then the very first light of dawn had brightened the sky quite a bit, though still barely perceptible with the naked eye. Posted in Alps & Europe and tagged Switzerland, Zermatt on March 31, 2011 May 19, 2013 by Jack Brauer. 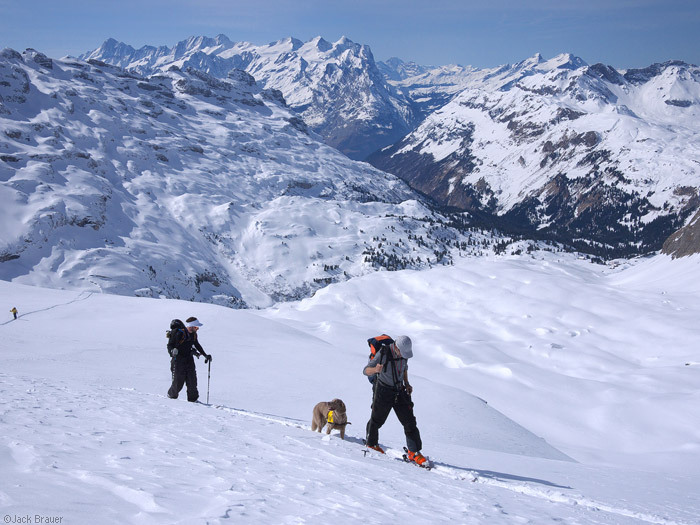 This week I met up with Jonas, a splitboarder from Finland, and we went on splitboard tours around Engelberg on Monday, Tuesday, and Wednesday. Here are a few photos from the last three days. In the top photo, you can see Wetterhorn down the valley. Titlis dominates the scene at Fürenalp. 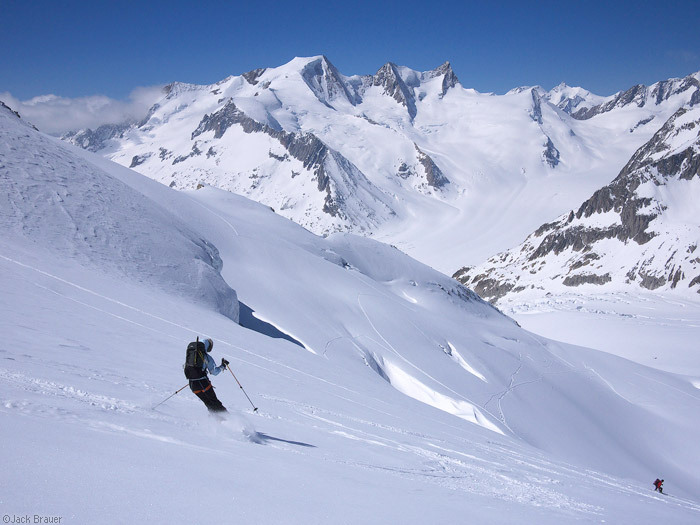 Posted in Alps & Europe, Skiing/Snowboarding and tagged Engelberg, Switzerland on March 23, 2011 May 19, 2013 by Jack Brauer. Moonlight illuminates the Matterhorn as a winter storm clears. 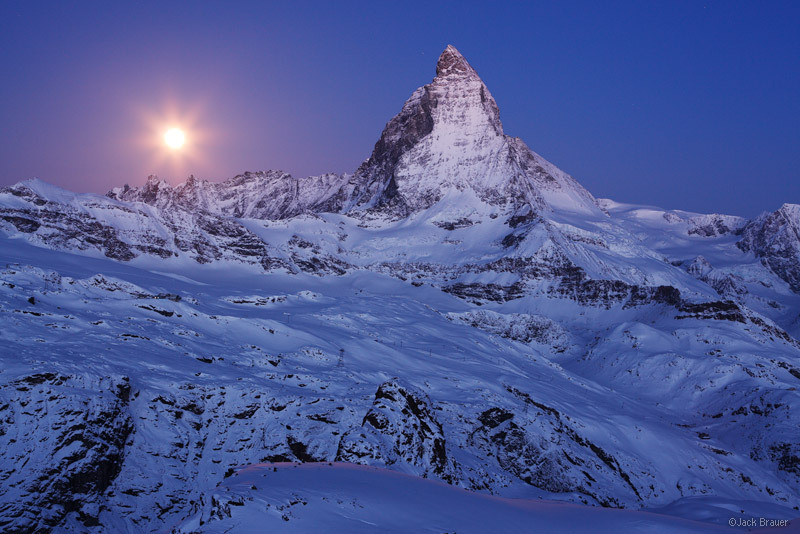 The full moon sets behind the Matterhorn (4478m / 14,692 ft.) - March. Sunrise alpenglow paints the summit of the Matterhorn (4478m / 14,692 ft.), as seen from Gornergrat. 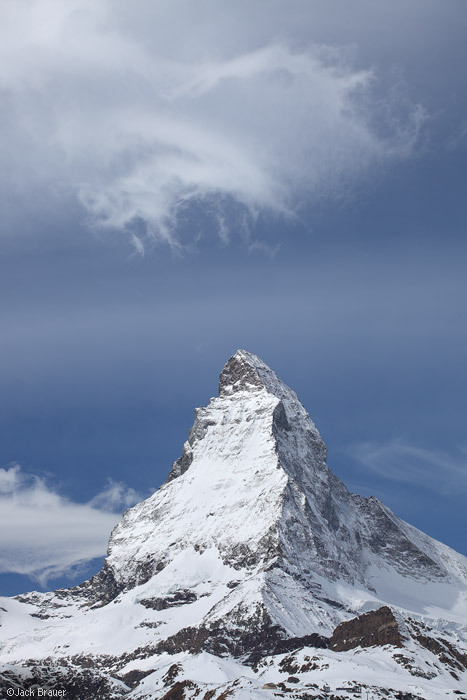 The Matterhorn is the icon of icons – easily the most photographed and recognizable mountain on Earth. While I normally try to resist photographing the most iconic, oft-photographed landscapes, the Matterhorn’s magnetic pull is too much for any photographer to resist, especially me! With a full moon and hopes for a clearing storm, this last weekend Claudia and I splurged for a one-night vacation to Gornergrat, a hotel perched on a high ridgeline nearly 5,000 feet above the town of Zermatt, with an incredible view of the Matterhorn. Though it was snowing as we rode up on the Gornergratbahn rack train, the storm broke shortly after sunset and I was super stoked to catch some photos of the iconic peak in the moonlight! 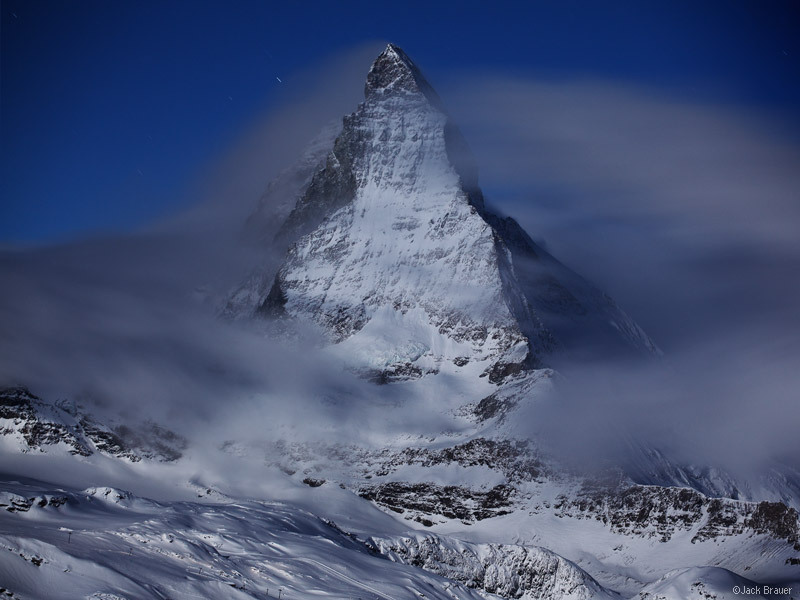 Posted in Alps & Europe and tagged Switzerland, Zermatt on March 21, 2011 May 19, 2013 by Jack Brauer. 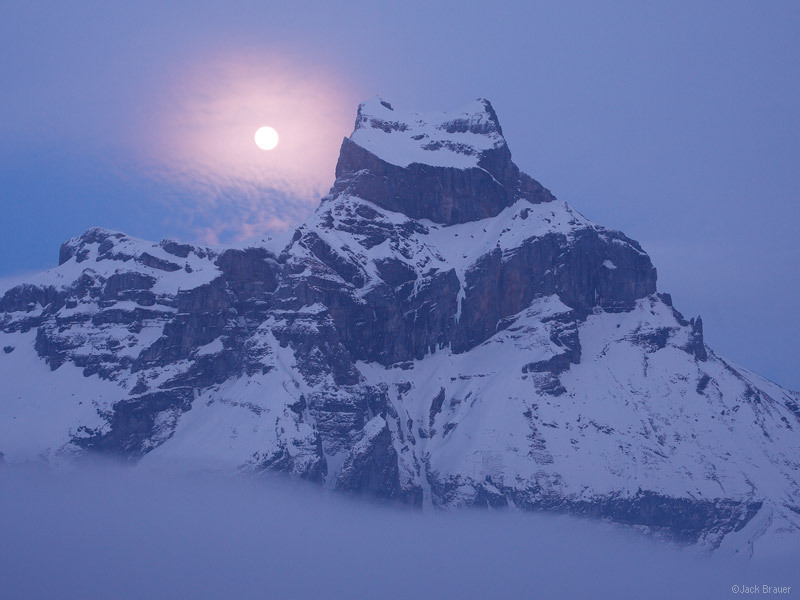 Posted in Alps & Europe and tagged Engelberg, Switzerland on March 18, 2011 May 19, 2013 by Jack Brauer.